Nothing says spring like the presence of flowers. Whether they’re grown in the garden or hand crocheted, they are bright and cheery and are sure to get you in the spring mood. In this post I rounded up a bunch of free floral themed crochet patterns that we have on the blog. The patterns range from appliques, to home decor items, to accessories. Be sure to check out more springy patterns on the Crochet Patterns for Spring page. 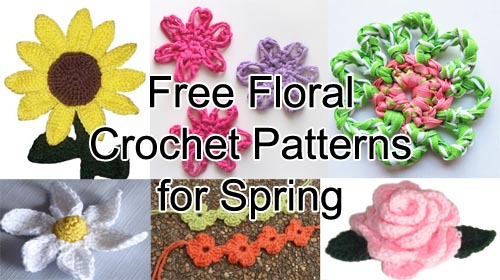 Be sure to check out more springy patterns on the Crochet Patterns for Spring page. This entry was posted on Wednesday, April 4th, 2018 at 11:53 AM by Rachel Choi	and is filed under Free Crochet Patterns. You can follow any responses to this entry through the RSS 2.0 feed. You can skip to the end and leave a response. Pinging is currently not allowed. Oh wow! These patterns are all great. Thank you!